Lineage. Constituted 325 Bombardment Squadron (Heavy) on 28 Jan 1942. Activated on 1 Mar 1942. Redesignated 325 Bombardment Squadron, Heavy, on 29 Sep 1944. Inactivated on 28 Feb 1946. Redesignated 325 Bombardment Squadron, Very Heavy, on 15 Jul 1946. Activated on 4 Aug 1946. Redesignated: 325 Bombardment Squadron, Medium, on 28 May 1948; 325 Bombardment Squadron, Heavy, on 16 Jun 1951; 325 Bomb Squadron on 1 Sep 1991. Inactivated on 1 Jul 1994. Activated on 6 Jan 1998. Redesignated 325 Weapons Squadron on 9 Sep 2005. Assignmets. 92 Bombardment Group, 1 Mar 1942-28 Feb 1946. 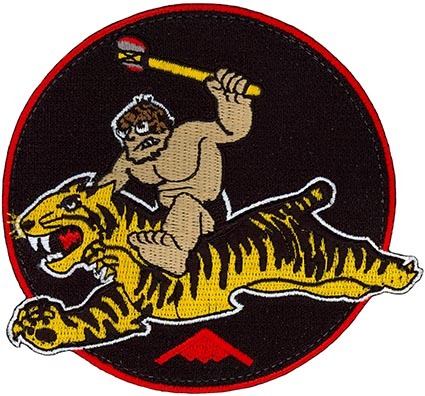 92 Bombardment Group, 4 Aug 1946 (attached to 92 Bombardment Wing, 16 Feb 1951-15 Jun 1952); 92 Bombardment (later, 92 Strategic Aerospace; 92 Bombardment) Wing, 16 Jun 1952; 92 Operations Group, 1 Sep 1991-1 Jul 1994. 509 Operations Group, 6 Jan 1998; USAF Weapons School, 9 Sep 2005-. Stations. Barksdale Field, LA, 1 Mar 1942; MacDill Field, FL, 26 Mar 1942; Sarasota, FL, 18 May-18 Jul 1942; Bovingdon, England, 18 Aug 1942; Alconbury, England, 6 Jan 1943; Podington, England, 15 Sep 1943; Istres, France, 12 Jun 1945-28 Feb 1946. Fort Worth AAFld, TX, 4 Aug 1946; Smoky Hill AAFld, KS, 26 Oct 1946; Spokane AAFld (later, Spokane AFB; Fairchild AFB), WA, 20 Jun 1947-1 Jul 1994 (deployed at Yokota AB, Japan, 9 Jul-29 Oct 1950; Andersen AFB, Guam, 16 Oct 1954-12 Jan 1955 and 26 Apr-5 Jul 1956). Whiteman AFB, MO, 6 Jan 1998- (deployed elements to Diego Garcia, 2003). Aircraft. B-17, 1942-1946. B-29, 1946, 1947-1951; B-36, 1951-1957; B-52, 1957-1994. B-2, 1998-. Operations. Performed antisubmarine missions while training in Florida, May-Jul 1942. Flew four combat missions while training replacement crews in England, 18 Aug 1942-6 Jan 1943. After reorganization, served in combat in European Theater of Operations (ETO), 15 May 1943-25 Apr 1945. Combat in Korea, 13 Jul-20 Oct 1950. Prepared for immediate launch of bombers on intercontinental attack missions for Strategic Air Command, 1951-1991, but ceased alert in Sep 1991. Unmanned, 6 Mar-23 Sep 1968; 15 Mar-14 Sep 1969 and Jun 1972-Oct 1973, while aircrews and aircraft deployed to Guam and Thailand for combat duty in Southeast Asia. Continued to take part in strategic bombardment training exercises until inactivation in 1994. Deployed personnel and aircraft to participate in Operations ENDURING FREEDOM and IRAQI FREEDOM in Mar 2003. From 2001-2003 flew missions from Whiteman AFB, and deployed elements to the Indian Ocean Area to perform combat operations in Afghanistan and Iraq in the global war on terror. Campaign Streamers. World War II: Antisubmarine, American Theater; Air Offensive, Europe; Normandy; Northern France; Rhineland; Ardennes-Alsace; Central Europe; Air Combat, EAME Theater. Korea: UN Defensive; UN Offensive. Decorations. Distinguished Unit Citations (Germany): 11 Jan 1944; Germany, 11 Sep 1944. Air Force Outstanding Unit Award with Combat “V” Device: 2 Mar-30 Sep 1969. Meritorious Unit Award: 1 Jun 2005-31 May 2007. Air Force Outstanding Unit Awards: 22 Aug-11 Sep 1953; 3 Mar-6 Oct 1959; 1 Jan 1961-31 Mar 1962; 1 Jul 1967-30 Jun 1968; 1 Jul-1 Oct 1968; 1 Jul 1969-30 Jun 1970; 1 Jul 1972-30 Jun 1973; 1 Jul 1976-30 Jun 1977; 1 Jul 1989-30 Jan 1991; 1 Jul 1991-30 Jun 1993; [6 Jan 1998]-31 May 1999; 1 Jun 1999-21 May 2001; 1 Jun 2003-31 May 2005; [1 Jun 2005]-31 May 2006; 1 Jun 2010-31 May 2012; 1 Jun 2012-31 May 2013. Republic of Korea Presidential Unit Citation: 10 Jul-24 Oct 1950. Republic of Vietnam Gallantry Cross with Palm: 2 Mar-30 Sep 1969. Emblem. Approved on 3 Jun 1943; newest rendition 10 Oct 2007.